Ready for a comfort upgrade? A new air conditioner can do wonders to make your family more comfortable and your home more energy efficient. New units are less likely to break down; plus, they offer better humidity control thanks to advancements in thermostat technology. The efficiency of central air conditioners is also much improved in the past ten years, providing greater savings. You could save up to 40% on your energy bills alone. We have other longer-term financing options available with approved credit. Give the office a call at 239-432-1500 for more information. 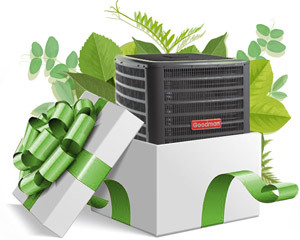 When it comes to enjoying the comforts of a new air conditioner, there’s no time like the present. We’ve teamed up with Wells Fargo to offer convenient financing options for qualified buyers via The Wells Fargo Home Projects® credit card. Today’s the day to stop putting your comfort on the back burner. Fill out an online application and receive a quick credit decision. *Subject to credit approval. Call FL Green Team at 239-432-1500 for details. 1The Wells Fargo Home Projects® credit card is issued by Wells Fargo Bank, N.A, an Equal Housing Lender. Special terms apply to qualifying purchases with approved credit. Minimum monthly payments are required during the promotional (special terms) period. Interest will be charged to your account from the purchase date at the APR for Purchases if the purchase balance is not paid in full within the promotional period. Paying only the minimum monthly payment will not pay off the purchase balance before the end of the promotional period. For new accounts, the APR for Purchases is 28.99%. If you are charged interest in any billing cycle, the minimum interest charge will be $1.00. This information is accurate as of 02/01/2018 and is subject to change. For current information, call Wells Fargo at 1-800-431-5921.